The fifth edition of Örebro OpenArt will take place on June 13 – September 06, 2015. Do you want to exhibit your artwork on an unconventional scene, open to visitors day and night, for almost three months? Do you want your art to receive tremendous exposure both online and offline? Are you interested in becoming one of the fantastic 40 to be on everyone’s lips for at least an entire festival season? 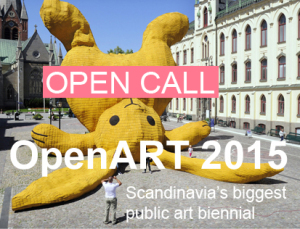 OpenART 2015 is what makes all this, and so much more, a beautiful reality, where art is wittily staged in the public realm. Scandinavia’s biggest urban art biennial is celebrating its five-editions jubilee, and with it, four successful editions that have turned its host city, Örebro, into an exciting meeting place for artists and art aficionados all over the world. If you think big and want to showcase on an edgy art platform, apply to OpenART 2015 and join them for a memorable experience. OpenART is open to all artists, in all stages of their careers and in most disciplines. The application deadline is November 30, 2014. To Submit your work use their application platform available at www.openart.se/opencall15. The application fee is 25 EUR (VTA included).